Well, this is it! After a year and a half of dreaming and planning, I will start the Continental Divide Trail tomorrow. There is so much I want to say and I’m trying to find the best way to explain how this feels when there are so many layers of emotions and thoughts. The goal of Walking With Wired is for the readers to feel like they are actually with me, so bare with me as this one may be longer than most. I had plenty of time to write tonight and the rest of my posts won’t be nearly this long. Yesterday, I flew to Tucson, AZ where I met up with fellow hikers Drop-N-Roll and Ninja, who flew in from the east coast. 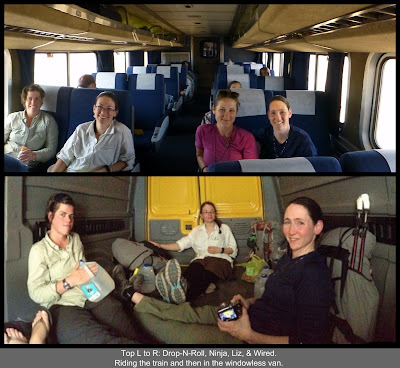 We stayed overnight in Tucson and then took the train to Lordsburg, NM. Our friend Liz was already on the train having boarded from Santa Barbara. 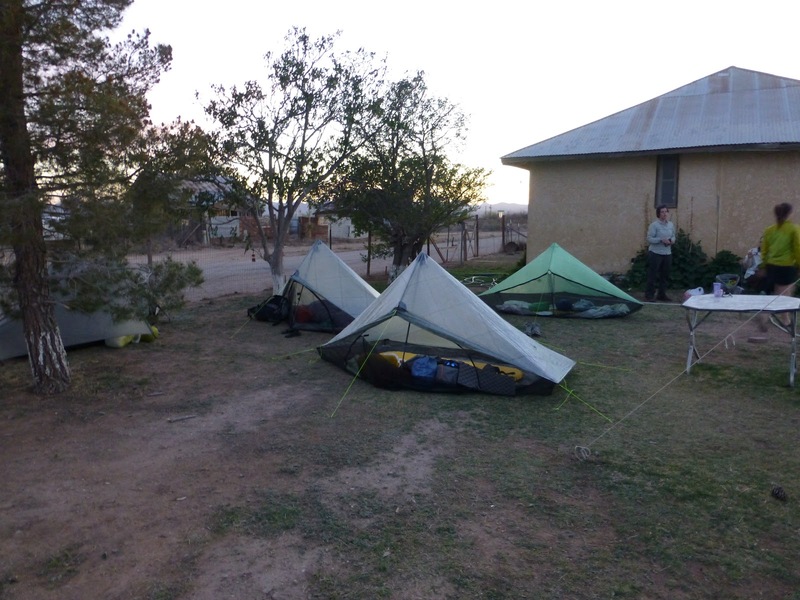 When we arrived in Lordsburg, we had arranged to stay with Sam Hughes who will drive us to the border tomorrow. He was shuttling hikers, so he had his neighbor Steven promptly waiting to chauffeur us around town to do our final errands and then take us to Sam’s. Steven was such a pleasure to be around! He patiently shuttled us from place to place as we got our last minute errands done. 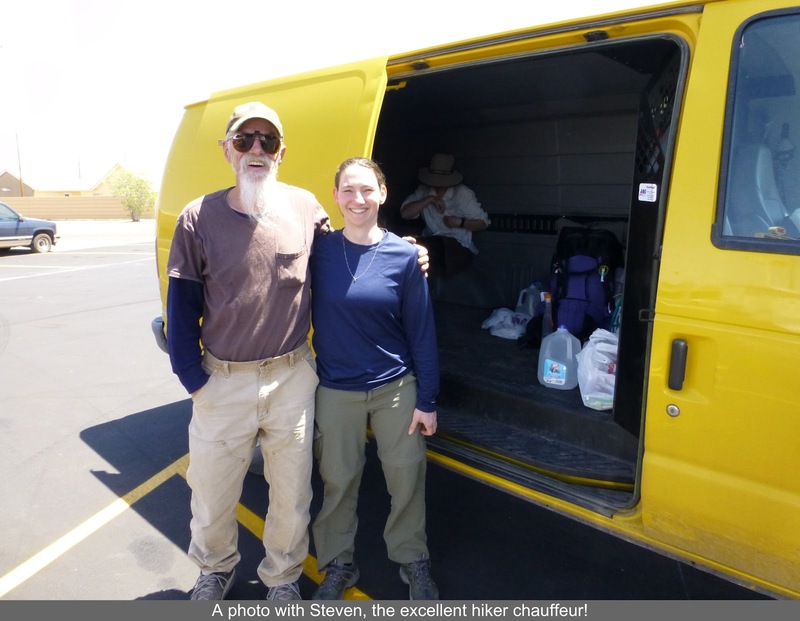 There are so many more hikers doing the trail, that Steven has stepped up to help Sam assist the hikers. Thank you Steven! 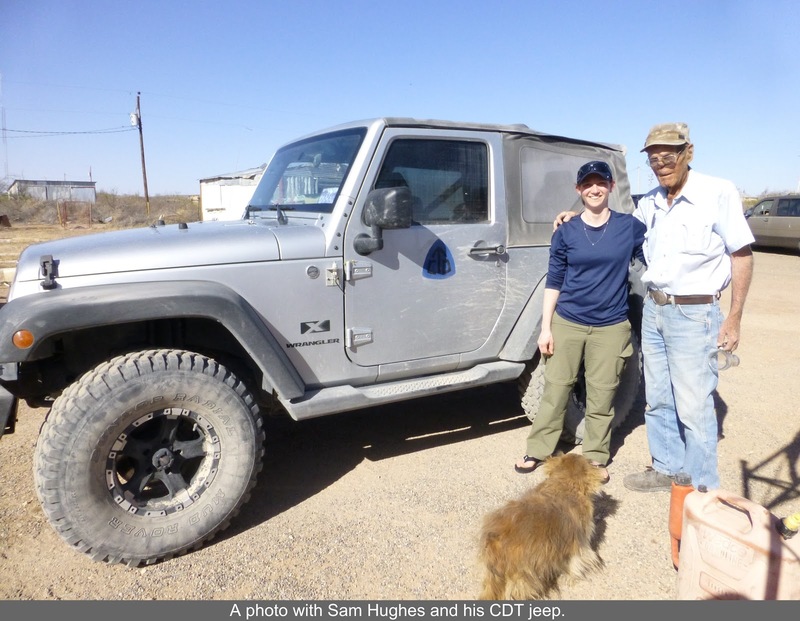 Sam lives in the tiny town of Hachita, NM about 40mins from Lordsburg. 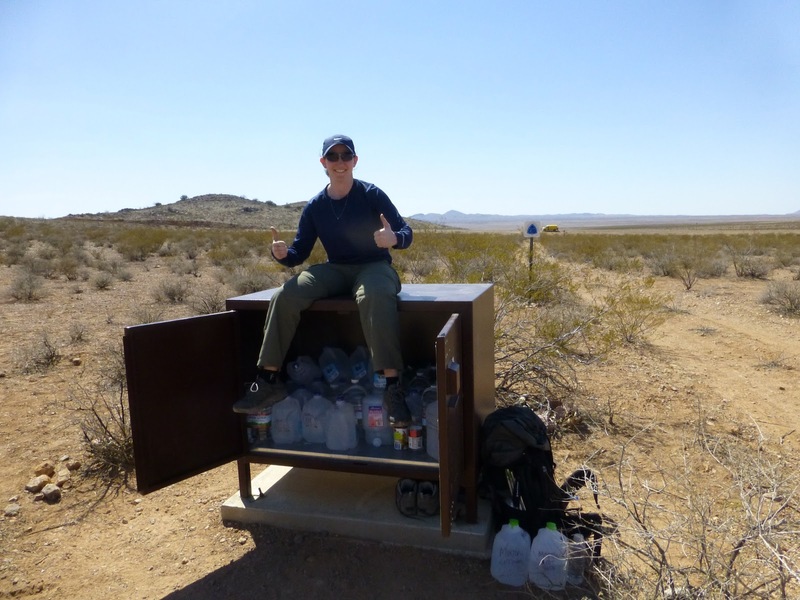 On the way, we stopped to drop gallons of water for ourselves at a cache we will get to in a few days. This whole section is very dry and most, if not all, of our water will come from caches maintained by Sam these first 4-5 days. 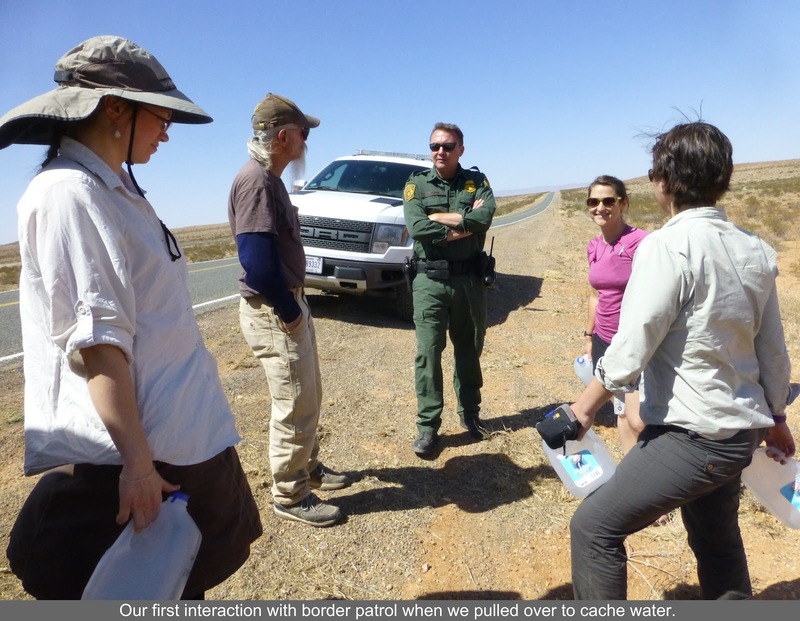 When we stopped at the cache, border patrol drove up behind us within 30 seconds. He came out of nowhere and it was really impressive. He checked in to make sure we were legals and then was on his way. We actually got to walk on the CDT to get to the cache and that was surreal! When we cached the water, a thru hiker was there taking a break. A really nice woman named Elizabeth(aka “E”) hiking solo. It was fun to already meet another hiker and we hope to see her again up trail. 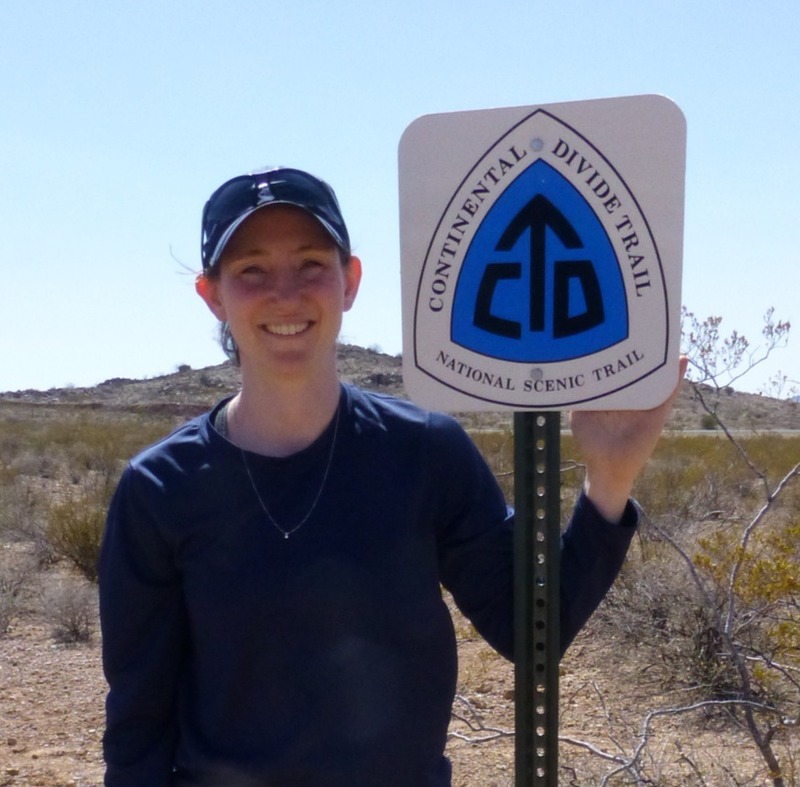 I also got to see my first official CDT sign! Being on the trail, seeing the cache, talking to another hiker really made it set in that this was happening! Everyone keeps asking how it feels to be setting off again and how it compares to how I felt on the last hike. I don’t plan on constantly comparing this experience to the last one, but I do think this is a good question to answer. I feel much calmer and prepared coming into this hike. I get moments of rushed adrenaline that washes over me every so often when I think of what’s about to happen (especially when we cached the water), but I mostly feel calm and ready…and tired since I haven’t slept much with all the final preparations over the last week. Having gone through this process before, I don’t have those worries of the unknown. I know how it feels to thru hike and I know I can do it. That is a big relief! I have a pretty detailed plan and it is great to be starting with Drop-N-Roll, Ninja, and Liz. All three also did the PCT in 2011 and we overlapped frequently. It’s a bond like no other to have gone through that together. Now, having one another as support and comfort at the start of an intimidating and challenging trail is invaluable. For more information on these ladies and the other hikers I plan to overlap with, check out my post titled “Continental Dream Team” under my CDT tab. Balls, Sunshine, and Beacon are a week ahead of us taking the “official route” where we will be taking the scenic and most traveled alternates. The plan is to unite this “Continental Dream Team” in N New Mexico to do the snowy San Juan Mtns together. How awesome would that be!? On my “Where’s Wired” tab is a great map showing my location along the trail each day along with other hikers who signed up and use a SPOT locator device. Beacon is on there so it will be fun to catch up to him, Balls, and Sunshine while tracking each other on the map. We got to Sam’s at 4pm and that was the first chance any of us had to just relax and take it all in. We laid in Sam’s yard and leisurely organized for tomorrow. Sam came home and hung out with us quite a bit. He is a very kind man who is 82yrs old, chain smokes, and has been helping hikers for 12yrs. He has lived in Hachita, a small town of 60 people, for about 25yrs. He said he worked in construction, has four children and many grand and great grandchildren. His wife passed away about seven years ago and a few years ago he got skin cancer that has required many surgeries on his nose which is almost now non existent. He is an amazing trail angel to open his home up like this and drive multiple shuttles a day the 2.5hr drive(each way!) down an old bumpy dirt road to the border. He charges a well earned and respectable fee for this service. It’s just amazing and shows how giving people are along the trail! We are camped in his yard tonight and it is wonderful and in the 50s. I’m sure it will drop much more overnight and we are leaving tomorrow at 7am to head to the border. What a day!